I’m not a computer programmer (sometimes I wish I was), so I’m going to guess that implementing the ability to save handouts as PDFs in OpenOffice.org’s Impress (OpenOffice’s version of Powerpoint) may be a very challenging programming task. For those who have never used OpenOffice, one of its greatest features is the built-in ability to save documents as PDFs. You can save your slides in Impress as PDFs, but if you want to put multiple slides on one page with lines for notes for your students (which is what I do with my discussion notes), there isn’t a way to directly export those handouts as PDFs. 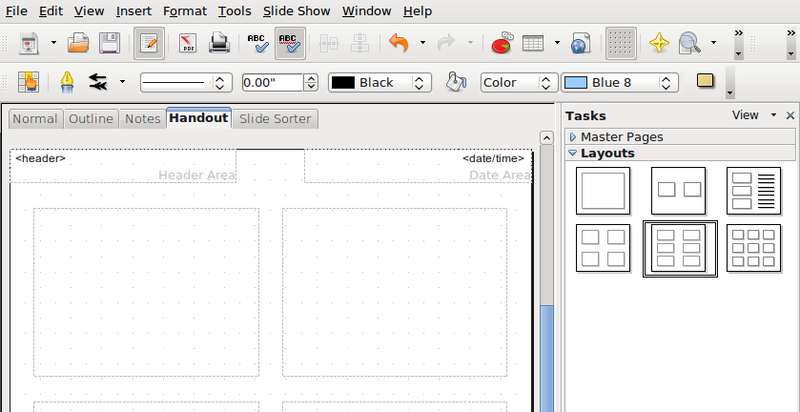 You can customize the handouts, which is a very nice feature, but you can’t save them to PDF. However, there is a way to work around this limitation. It’s actually quite simple, but it took me about 30 minutes to figure out. So, here’s another Ubuntu how to. What does the above do? 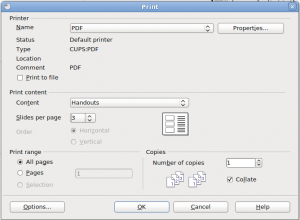 First, it installs the CUPS PDF printer. Second, it makes a directory in your “home” directory called “PDF,” which is where the PDF printer will send your documents when they are printed. Third, and this is the part that is difficult to do from anywhere other than the command line, it adds access to the CUPS PDF printer to your User. If you don’t do that, you can’t access the printer. The last line simply restarts the CUPS printer. When you’re ready, hit “OK”. Now, go check the “PDF” folder in your “home” directory and you should see a PDF there with the handouts. Voila! You can now create PDFs of handouts in Impress. 1) You can set the printer to print in color by clicking on the “Properties” tab. It’s set to print in “grayscale” by default. 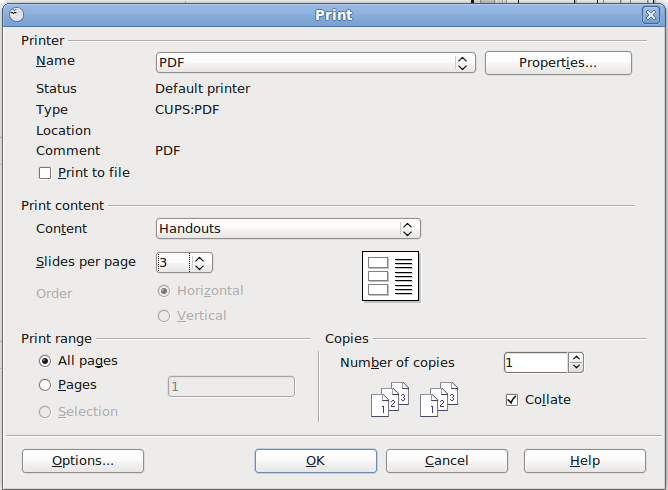 2) You can also set the PDF printer as the default printer in Ubuntu. Go to “System->Administration->Printing.” You should see the PDF printer. Right-click it and set as default. 3) Microsoft’s Powerpoint can’t do this either. You have to install a PDF printer in Microsoft’s Powerpoint to achieve the same effect. That’s awesome. Thanks for that. Just the trick. Hi, I followed your instructions, but the pdf does not show up in home/PDF until I go to the printer dialogue and perform the ‘retrieve’ action. How can I fix this? Thanks for a good post!